· In 1994, it had been discovered at Slapton Ley, but the bush on which it grew was cleared as part of conservation scrub clearance. · Next, it was found on a hawthorn bush on the shores of the Drift Reservoir in Cornwall, but when the water level rose and submerged the bush, its only known modern site was once again lost. · More recently it was found on a branch fallen from an apple tree in Herefordshire. Not a very promising situation for its continued survival, but shortly after that, it was found in County Cork and as far as I know, that site is still extant. It also occurs on Guernsey on two bushes where I saw it recently. In Jersey however, it was last seen in an orchard back in 1966. A recent trip to the site confirmed that all the apple trees had gone. On Boxing Day I met up with Mark Jackson and he showed me the two bushes each with just one Teloschistes chrysophthalmus. We had a good look round at other trees, but found no more. However, on our way back to the car, Mark found a minute, pink lichenicolous fungus growing on a twig. I photographed it, and sent off the photograph to the experts. It is Illosporiopsis christiansenii and new to Sussex. 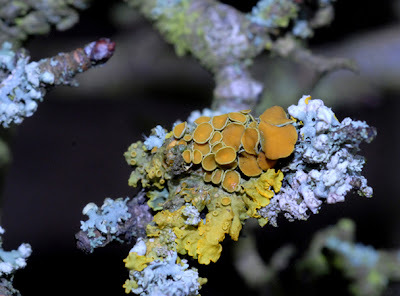 Mark is lucky in having an excellent eye for lichens, as well as a great enthusiasm for them. Since the 23rd of December, I have learned that Teloschistes chrysophthalmus has turned up recently in four sites on the Isle of Wight as well as single sites in Dorset, Hampshire and Kent, so the discovery of it in Sussex links up all the counties in the South Eastern quarter of England. In the past, it was thought that Teloschistes chrysophthalmus was probably the most pollution sensitive lichen species, at least to the sulphur dioxide pollution that occurred in Britain. Its recently discovered distribution however would seem to refute this. In Sussex, the site is no more than 400 yards from the edge of the Brighton conurbation. Until relatively recently, there was a power station downwind at Shoreham, and with the whole of Brighton and Hove downwind of the site, the air cannot be considered pure, even with the considerable improvement in air quality throughout Southern England. Clearly Teloschistes chrysophthalmus is not behaving as the delicate, hyper pollution sensitive species it was previously thought to be. Outside Britain, I have some experience of Teloschistes chrysophthalmus. It is certainly rare in Europe. I first saw it on a twig at Amelie les Bains in the French Pyrenees in 1974. 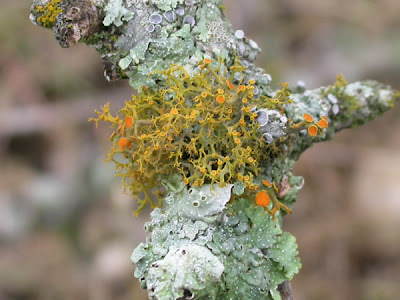 In 1993, I found it in Corfu, and these experiences made me believe that because of the dry atmosphere any sulphur dioxide would not be turned to sulphurous acid, the active compound that causes havoc to pollution sensitive lichens. In 1994, my ideas about the problems of air pollution and Teloschistes chrysophthalmus were somewhat shaken when I stayed in a hotel on the edge of Quito in Ecuador. 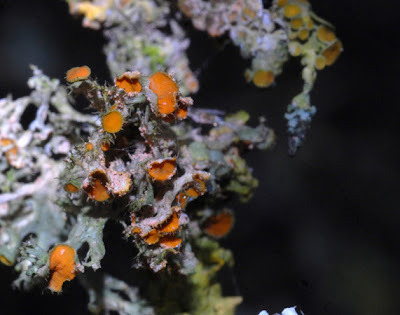 On a Jacaranda tree in the grounds of the hotel, I found a lichen flora consisting of some of the most sensitive lichens known belonging to genera such as Lobaria and Sticta. Amongst the many other species, I found Teloschistes chrysophthalmus, and as will transpire, even more surprisingly I found Teloschistes flavicans. At the time, I did not know of the closely related Teloschistes exilis, which my record of Teloschistes chrysophthalmus might actually have been. In 2004, I visited Texas and became aware of Teloschistes exilis. I found it, along with Teloschistes chrysophthalmus on twigs that had fallen from the upper branches of suburban pecan trees in Fort Worth. I also found them relatively close by in Dallas. These are part of an enormous conurbation, known in America as the Megalopolis; certainly, not an area particularly noted for pristine air quality. In fact, the distribution of members of the genus Teloschistes in the United States is most interesting. There are six North American species. One occurs in arctic Canada and is extremely rare. Like Teloschistes flavicans, it is non fertile, but sorediate; this one is Teloschistes arcticus. Then there are Teloschistes californicus, which is a rare coastal species in Southern California. Similar to this is Teloschistes villosus which is confined to Mexico. Then there are Teloschistes flavicans, exilis and chrysophthalmus. While in America Teloschistes chrysophthalmus and exilis appear relatively unfussy about air conditions, Teloschistes flavicans is almost totally western and coastal, and demands very clean air. This is so much mirrored by its requirements in Britain. In fact, it seems that the fertile species of Teloschistes, although rare, seem to be less fussy about sulphur dioxide in the atmosphere. I was struck by the associated species growing with the Teloschistes chrysophthalmus in Sussex. While there were hawthorn bushes relatively free of the bright yellow and very common species belonging to the genus Xanthoria, it was only on those whose twigs were golden with Xanthoria that the Teloschistes occurred. 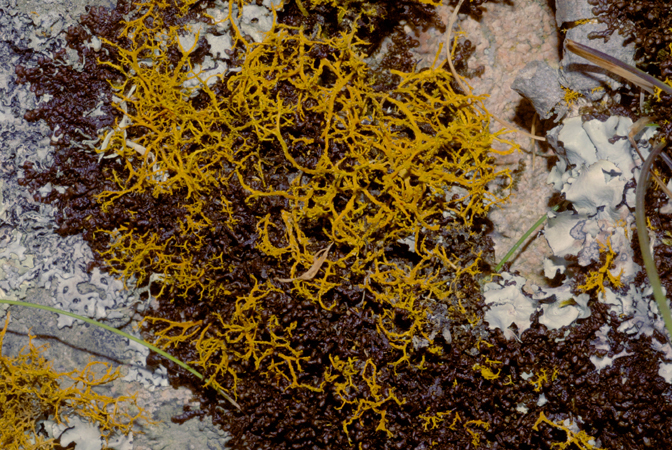 It was also noticeable that Xanthoria polycarpa, a species that relishes enrichment, and high levels of nitrogen compounds was frequent on both bushes supporting the Teloschistes. In fact the flora of both bushes was characteristic of high levels of nitrogen compound enrichment. Could it be an increase in average temperatures that has encouraged Teloschistes chrysophthalmus into southern England? Could it also be that Teloschistes chrysophthalmus requires high levels of nitrogen compounds for its spores to germinate. If this is the case, with the use of catalytic converters on car exhausts creating high levels of ammonia, this could be what causes two of the Teloschistes species to occur so readily in the Dallas conurbation. Another intriguing question to ask is where do the spores come from? After all Teloschistes chrysophthalmus is a very uncommon species in Europe. Being a twig species, it must also be a rapid coloniser, and relatively ephemeral. A few days into the New Year, I happened to be going to Hampshire, and as it turned out the reason for my visit took me to about two miles from the Hampshire site. It took a very short time to find the Teloschistes chrysophthalmus, this time growing on a blackthorn bush. There was just one plant of it, and it looked less healthy than the Sussex plants. The twigs of the bush were yellow with Xanthoria indicating high levels of nitrogen enrichment, and especially well developed was Xanthoria polycarpa. It was also very close to the centre of an urban area. Naturalists should be encouraged to look out for Teloschistes chrysophthalmus. It appears so far to have been found mostly on mature hawthorn, and perhaps a lesser extent on blackthorn, which are blasted by strong, coastal winds from the south west. It is astonishing how similar Teloschistes chrysophthalmus can look to the common Xanthoria polycarpa when viewed from a short distance and I suspect it may have been overlooked for this. The Teloschistes has brighter orange discs, or fruits, and they are always surrounded by hair like cilia, or whiskers. 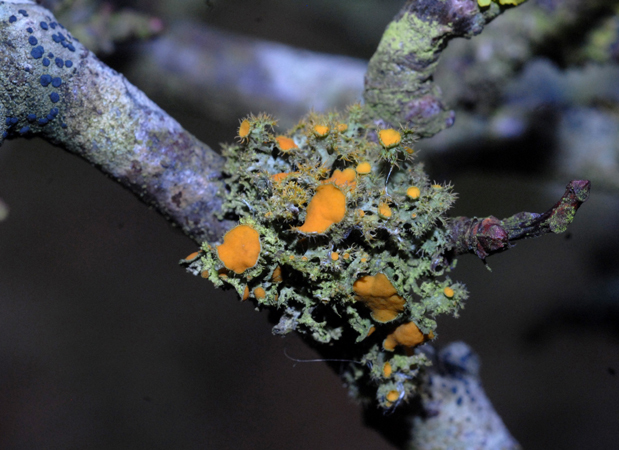 These are never present surrounding the duller discs of Xanthoria polycarpa. Also intriguing was the presence of the lichenicolous fungus Illosporiopsis christiansenii on a different bush perhaps six feet away.